Call Us Today for Expert Truck & Trailer Repair! Sargent’s Wrecker Service is a family owned and locally operated business proudly serving Parker County and the surrounding Weatherford, TX areas since 1987. With the largest and most diverse fleet of tow trucks, we offer 24 hr tow truck service and wrecker service for both autos and heavy duty trucks. Call for quick, reliable service anytime and everywhere. In addition to our wrecker service, we also offer truck and trailer repair service. If you are in the Weatherford, TX area, we can get you back on the road quickly with our roadside service or we can bring your truck into our truck & trailer repair shop where our dedicated ASE Certified mechanics can quickly diagnose and repair your truck. 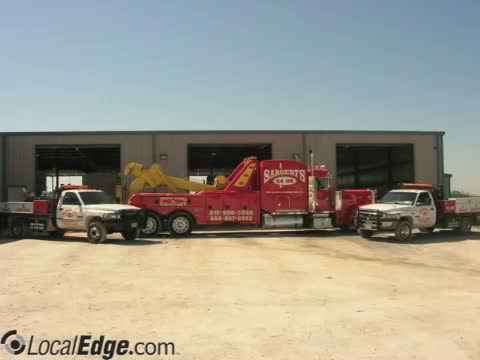 At Sargent's truck & trailer repair we believe that our customers should receive a quick response time and total satisfaction of the tow truck service work. Our experienced professionals are equipped with the newest technology to complete the work. Our staff will work with you to insure you an affordable appraisal of your insurance reimbursement. Our mission is to provide the highest standard of automobile, truck, municipal, and private property impound towing, and recovery services to customers and to continuously strive for flexibility in servicing our customers' needs in an expedient and cost-efficient manner. Implement improvements in areas such as dispatching technology, driver training and professionalism, preventative maintenance, and safety. Continuously investigate new technologies to improve dispatch systems, brokering systems, and to enhance administrative and financial functions. Expand our specialized services in other markets both regionally and nationally. Continue to improve our towing, recovery and equipment transport sectors to provide greater uniformity of service in major regions. Our regional presence provides consistent, high quality towing services to customers within our operating region. We continue to broaden our network by actively adding high quality towing, recovery, and storage services across the country. Proudly serving the Weatherford, TX and Parker County areas. Inclement weather conditions, such as heavy rains and snow showers, and heavy traffic can cause many drivers and their automobiles unforeseen accidents. At Sargent’s Wrecker we can be your solution for getting you back on the road with our 24 hour roadside service. Give us a call and we will come to your aid! Wrecker/Towing, Heavy Duty Road Side Service, Truck & Auto Repair, Roadside Service, Heavy Duty Towing for Big Rigs, Heavy Duty Towing for RVs, Heavy Duty Truck Repair, Flatbed Tow Truck, Heavy Duty Tow Truck, Heavy Duty Road Side Service, D.O.T. Truck Inspections.